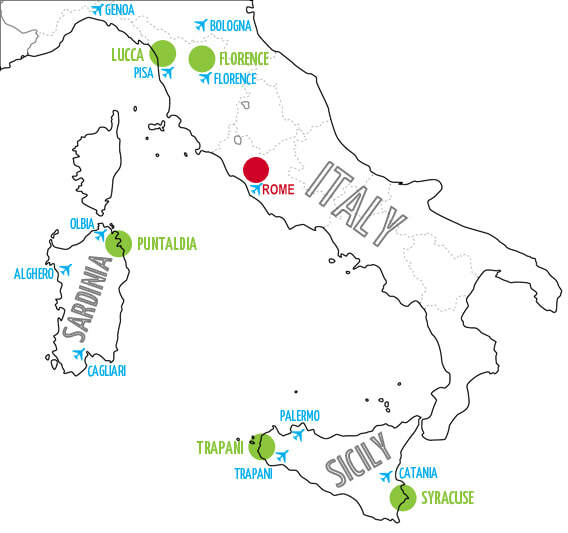 The Italian Open is one of the just three ATP World Tour Masters 1000 events contested on red clay. Held at the Foro Italico in Rome in the second week of May, it attracts an impressive line up of the top players. In 2018, Rafa Nadal took the title for a record eighth time beating Alexander Zverev to return (temporarily) to no.1 in the ATP rankings. This is your opportunity to watch the drama unfold for yourself and brush up on your own clay court game into the bargain. Ian and Laura are organising 2 special hosted trips with limited places to the Rome Masters 2019. No need to stress about tickets, transport or accommodation - it's all taken care of. You just have to get yourself to Rome . After that, Ian and Laura - both fluent Italian speakers - will take care of everything. In the mornings, before the action begins on the clay at the Foro Italico, Ian and Laura, assisted by local tennis coaches Iuri and Andrea, will put you through your paces at a nearby local club. In the afternoon at the Foro Italico you will be able to enjoy not just the tennis but the total entertainment experience that is the Rome Masters. High fashion, fine food and fabulous shopping have made the tournament one of the most glamorous stops on the ATP World Tour. ​The Rome Masters has been won 8 times by Rafael Nadal and tends to attract all of the world’s best players. If you like shopping for tennis clothes/equipment then inside the grounds of the Foro Italico you can choose from a huge variety including all the famous brands plus some local Italian gear. Possibly the best range of tennis merchandise to be found in Italy all in one place! ​The first photo above is the Pietrangeli Stadium which is paved in marble and is available for viewing with only a ground pass! The next photo is the main show court, Campo Centrale. If you fancy a break from playing/watching tennis then the centre of Rome is a 10 minute taxi ride from il Foro Italico. One of the most talked about cities in the world with so much to see and do. The Colosseum, the Vatican, Spanish Steps, Pantheon, Trevi fountain etc etc. Our local Roman tennis coach, Iuri, will help you get to know the city from an insider's point of view. This will include the places that locals would go to eat and drink, avoiding the tourist traps. The Residence Sacconi is an elegant four star apart-hotel a 2km walk to the Foro Italico for the Rome Masters located right behind the city center in one of Rome’s most exclusive areas well served by public transportation. It is situated within the city’s cultural and athletic square formed by the Auditorium Parco della Musica, the MAXXI Museum, the Olympic Theatre and the Flaminio Stadium, in front of the Olympic Stadium. Every apartment is 50 sq m and has a living area with a sofa bed plus a double/twin bedroom. There is also a fully equipped kitchen, bathroom, air con, TV with SKY and free WiFi. The Residence Sacconi offers all the hotel comforts including a 24 hour reception. The lovely Residence Sacconi has been chosen for it's quality and location. Your accommodation, Il Foro Italico and our tennis club are all within walking distance of each other avoiding any requirement to drive in Rome! Plus it's only a short tram ride or 20 minute walk from your accommodation to the very heart of Rome! You have 2 choices of when to visit below. The first option would allow you to see the earlier rounds but also the opportunity to see players practising which can sometimes be more interesting than the matches themselves! And obviously our 2nd option would allow you to see the latter stages where we even include a ticket for finals day! Tickets in option 2 cost more hence the price difference. Optional discussion of the matches watched with Ian & Laura within the Foro Italico on each afternoon at a prearranged place & time. Also a good excuse for a coffee or aperitivo! ​Should you have any questions or wish further information please contact Laura on laura@tuscantennis.com or +44 1415767205.